Despite TSA’s best efforts to protect this country by randomly selecting a mother of three with children under six years old sans another adult companion, we managed to make it to Myrtle Beach. The ticket agent neglected to give my husband his boarding pass. When he gave us the stack of tickets he put them an envelope so we didn’t notice until we got to the lead TSA agent wouldn’t let him pass (righftully so), and it put me in a challenging position. We had two car seats and three backpacks and three kids. Dan left with his backpack to go get his boarding pass, I proceeded to go through security with the gang. We made it through the metal detectors, but the bag didn’t – it was selected for a random screening. At the same time the car seats were being manually searched. The kids were running around the area of the inspection. 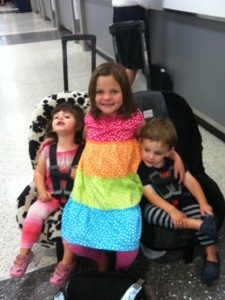 Another TSA agent took the car seats and the stroller attachment to do a manual screen. One tested postitive for something, so they needed to take the stroller piece off of both to put through the x-ray machine. Because the stroller had a positive match the TSA agent who had completed my bag and started to give it back to me, grabbed it from me again and took everything out – again. At the same time I saw Dan go through security, but didn’t see him show up at the inspection desk – he didn’t see us so he assumed we went to the gate (because a lot of time had passed.) I peeked around the inspection desk and saw him far down the corridor – I screamed “DAN!” three times and until he heard me. It wasn’t my most embarrassing moment. He came back, but now the TSA agent needed do a total pat down on me. I can see why there are so many complaints – it was invasive, I guess they do it for real when you are a suspect. Dan took the kids and left me with the two seats, stroller attachments and my giant back pack. I ran as quickly as I could with all of my parafanalia. This was not my most embarrassing moment. When I reached the gate we were all told to get on the plane quickly. I had one of the car seats, Dan had the other with the kids in between us. I was told the car seat would not make it down the aisle on the stroller contraption and that I needed to take it off before proceeding. With great difficulty I was able to get the two apart and had them in either hand, with my backpack on my back and three kids trailing behind me – I went down the aisle saying, “Sorry, pardon me, excuse me, sorry, watch your leg, pardon me, so sorry….” This was not my most embarrasing moment. As I was going down the aisle I heard, “there is Kyra’s Dad.” I look over and there is Eric Wolin, I said “hello Eric, sorry I can’t talk now.” Still not the most embarrassing moment. I got to row 19. I put my seat in the middle seat, then the flight attendant came and said it couldn’t go there because it was blocking in another passenger. I had to get the kids to move out of their seats so I could move the seat to the other side. As I fastened it into the seat, I heard the flight attendant announce, “I need the wife back up front.” This was the most embarrassing moment. I had to walk back up the aisle to the front to see why they needed me. Dan was standing there with the car seat and stroller still attached with the gate attendant yelling at him. He was telling us we were going to have to leave the car seat in Boston because there was no way to get it apart and get it under the plane before we took off. We refused. Then the very nice flight attendant asked the pilot if we could put it in the cockpit, he said “of course. no problem.” We ran to our seats and buckeled up. 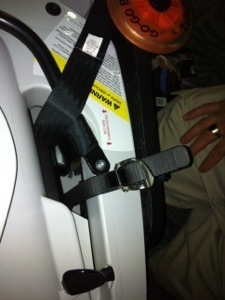 The seat and stroller wouldn’t come apart because the TSA agent put it together wrong. He essentially broke it. Luckliy we met my dad in Myrtle Beach who can fix anything. Every ounce of patience was milked from every person involved – especially the gate attendant.